The National Science Foundation (NSF) has a long history of supporting basic research that leads to marketable products. Through the Small Business Innovation Research (SBIR) program alone, NSF awarded more than 300 grants in FY 2001, many resulting in viable technologies. Grants from other NSF programs produce similar results. Some technologies serve needs even beyond what the original investigators had imagined. These news tips highlight just a few exciting new technologies at various stages of development and commercialization. Three Dimensional Printing: Shortcut to the Final Product? For almost two decades, engineers have been able to create models directly from computer drawings, layer by layer, with Solid Freeform Fabrication technologies. One method, Three Dimensional Printing (3DPTM) shows promise for the direct manufacture of goods ranging from bone grafts to automobile parts. Emanuel Sachs and colleagues at the Massachusetts Institute of Technology developed 3DPTM with support from NSF and other federal agencies. Currently, five independent companies are pursuing 3DPTM applications. The process is based on the understanding that any shape can be built from stacked layers, "Think Pyramids at Giza," said Sachs. 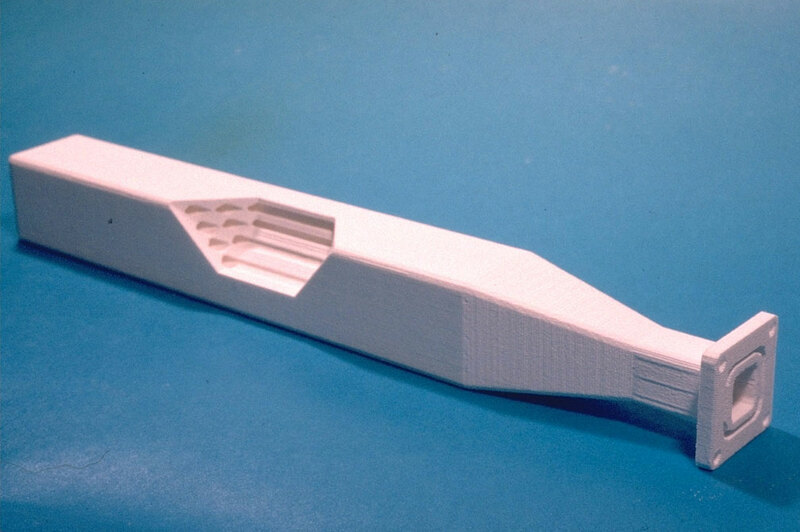 In 3DPTM, the 30 to 200-micron layers are comprised of powdered ceramic, metal or plastic composites. 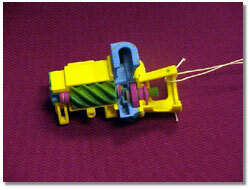 Ink jets apply a binder between each subsequent layer after it is deposited. The resulting structures can be highly complex, with complicated internal geometries that would be difficult to machine using standard engineering methods. In addition to advancing 3DPTM technology, Sachs has been developing a new method for instructing the next generation of engineers. See the sidebar for more information and graphics. 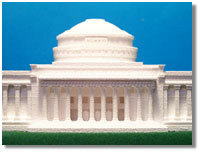 This 3DPTM model of the dome at MIT's Great Hall demonstrates the intricacy and detail possible with the process. 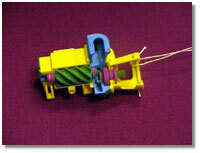 By using different printer jets to produce different parts, the 3DPTM technology is capable of creating color-coded objects, such as this model of a compressor. 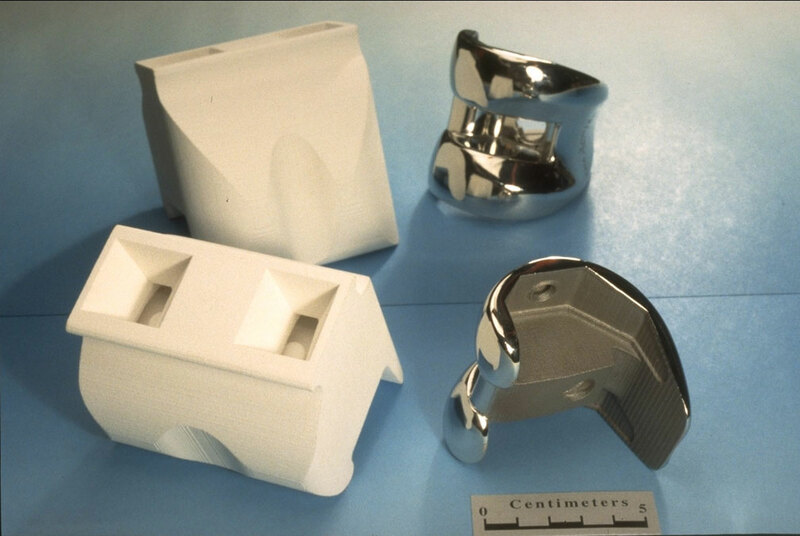 This photo shows a ceramic mold made by 3D Printing and an orthopedic knee casting poured into a similar mold. The knee casting has been polished on the back side as can be seen in the reflection in the mirror. The casting is made of a medical cobalt chrome alloy. 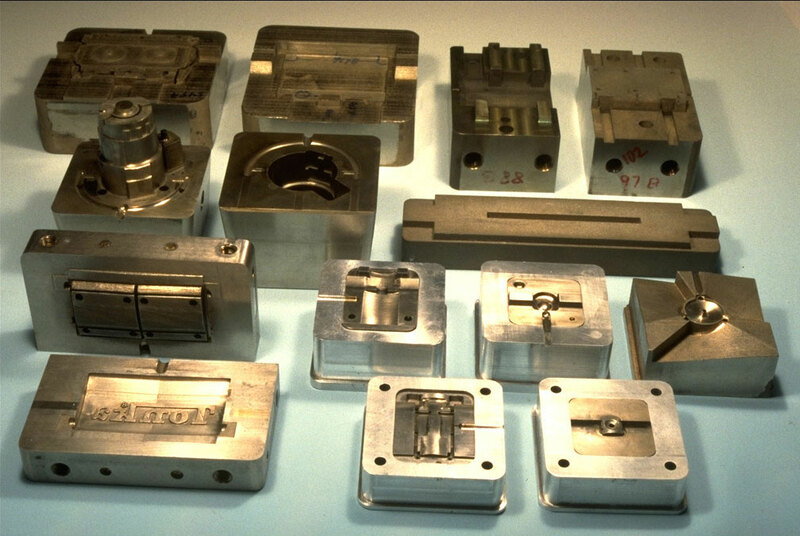 This photo shows a family of injection molding tools made by 3D Printing. The tool in the lower left corner is approximately 150 mm long. Many of these tools have conformal cooling channels printed within them. Such channels lead to far better temperature control during the injection molding resulting in faster production and high quality parts. 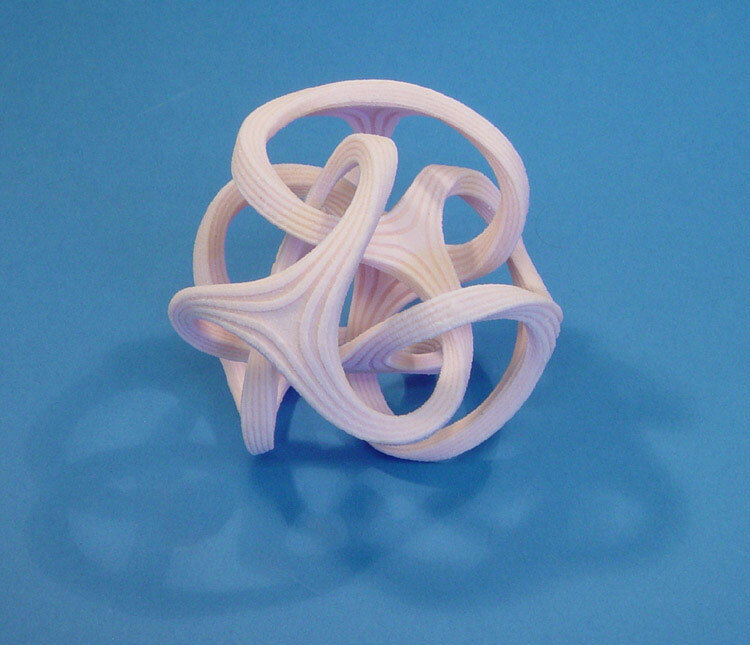 This object was printed directly from a mathematical model and would be extremely difficult to manufacture by conventional techniques. 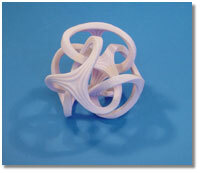 It is intended as an illustration of the geometric capability of 3D Printing. This model was made by Z Corp., maker of what are said to be the world's fastest 3D printers. This photo shows a ceramic filter made by 3D Printing. The cut away shows the internal passages created as part of the printing process. 3D Printed filters are being applied to the clean-up of power plant emissions. Sound pioneer Tomlinson Holman, developer of the Lucasfilm THX Sound System© used in thousands of movie theaters, recently received a 2001 Academy Award Certificate for Technical Achievement recognizing his more than two decades of research as an audio engineer at the forefront of movie theater acoustics and speaker technology. In addition to developing THX - the name derived from Tomlinson Holman's eXperiment - Holman was lead developer of George Lucas's state-of-the-art cinema production facilities Skywalker Ranch and Skywalker Sound. Now a professor and researcher at NSF's Integrated Media Systems Center (IMSC) at the University of Southern California, Holman is focusing on the next generation of cinema sound, especially the 10.2-channel surround sound system. The 10.2 system, designed for public and home theater use, uses 12 speakers in 10 locations, plus two subwoofers, to create a better sense of aural immersion. The range of pitches and loudness for cinema sound have already exceeded the limits of human hearing and Holman believes sound space is the next frontier for audio research. Under the direction of Chris Kyriakakis and Holman, NSF's IMSC Immersive Audio Lab is researching methods to expand these spatial limits - what Holman calls "the Manifest Destiny of recorded sound." 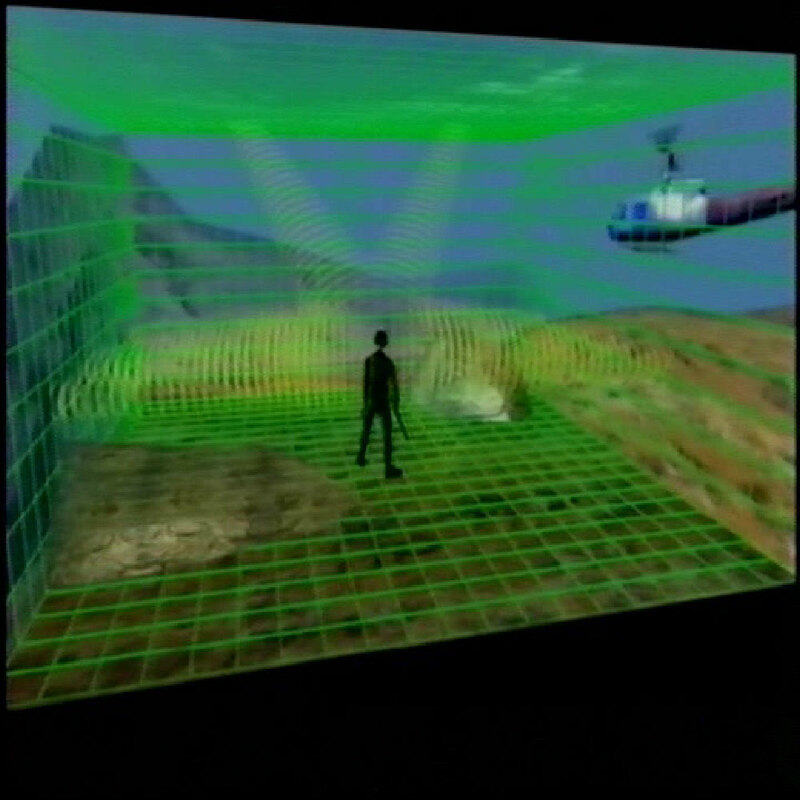 The graphic depicts a soldier in an immersive training environment. 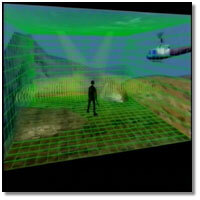 The environment uses 10.2 sound and high-resolution imagery to accurately simulate the acoustic and visual space of a combat setting. Photo Credit: Image is property of the Integrated Media Systems Center (IMSC). 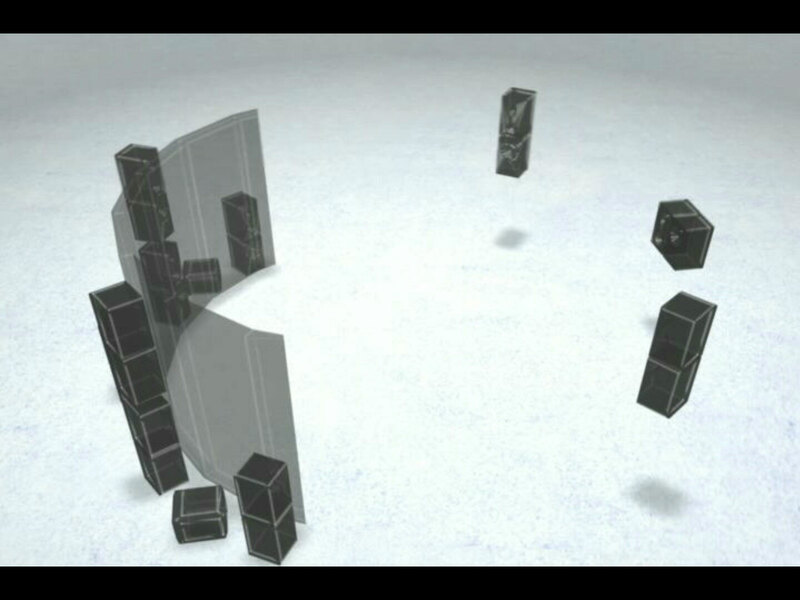 Image courtesy of IMSC and DARPA. Setup of the 10.2-channel surround sound system, an immersive audio system being developed at NSF's Integrated Media Systems Center at the University of Southern California. 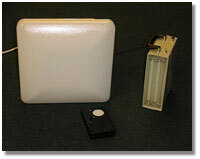 Fluorescent lights used in the Talking LightsTM system. 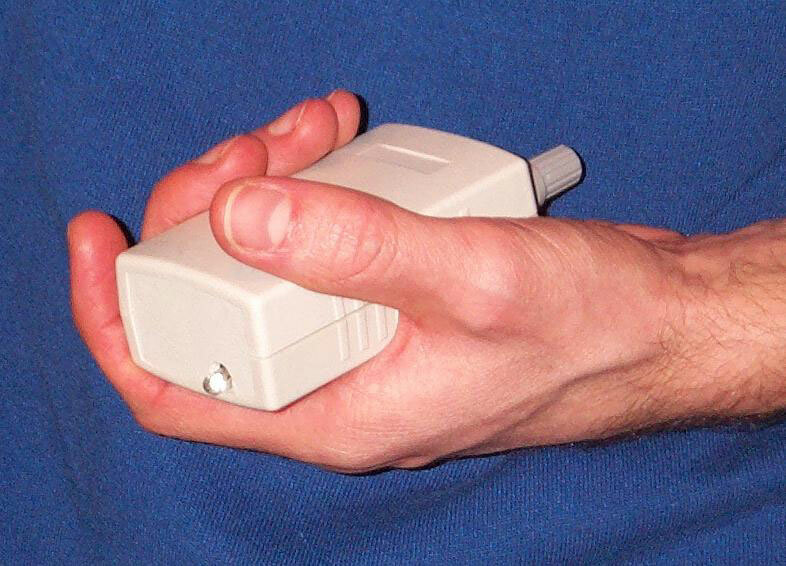 Handheld receiver used in certain applications of the Talking LightsTM system. Engineers have developed a system to turn a fluorescent light into a transmitter by controlling the rate of its flicker. The system, known as Talking LightsTM, is the first to use the frequency of the incoming electric current to transmit both analog and digital information. MIT engineers Roderick Hinman (who has an NSF Small Business Innovation Research (SBIR) grant), and Steven Leeb (who has an NSF CAREER grant) developed the Talking LightsTM technology with additional support from other federal agencies. Now in the testing and prototype phases, the system may have applications for disability assistance, education and national security. 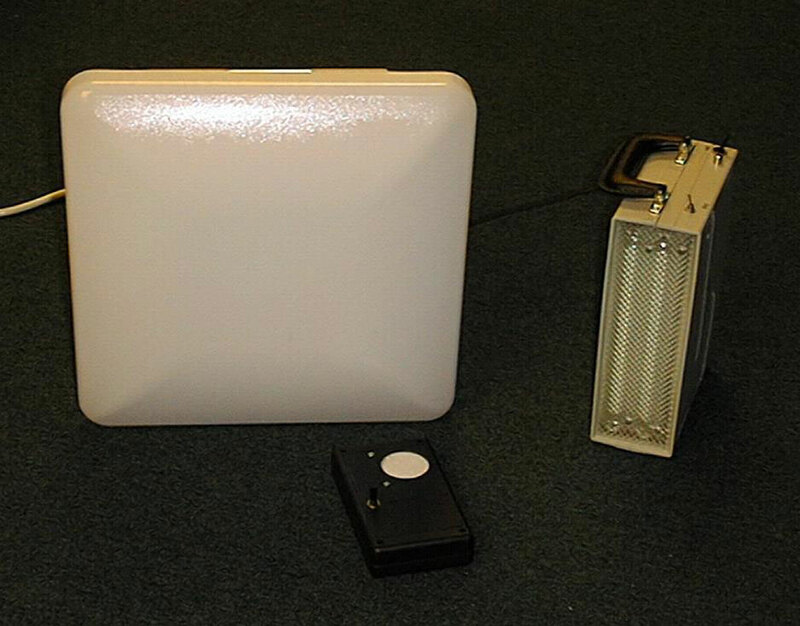 Talking LightsTM uses existing fluorescent light fixtures, replacing only the light's ballast with the ARCLightTM ballast to control the frequency of the electric current. In a demonstration at MIT, Leeb placed a receiver and speakers at one end of the room and a Talking LightsTM fluorescent light at the other. When he turned on the light, Handel's Hallelujah Chorus played from the speakers, with all audio data arising solely from the light's imperceptible flicker. "The concept of this communication system is highly innovative," said NSF's Sara Nerlove, an SBIR program manager. "Unlike other specialized communications systems, it does not need to generate and radiate a carrier signal. Instead, it takes advantage of existing installations that generate and radiate light." Leeb and his colleagues call Talking LightsTM a dual-use, local area wireless system because the original purpose of the device - illumination - persists while information is transmitted. Because fluorescent lights are ubiquitous and the modifications are minimal, the researchers believe Talking LightsTM may have a variety of uses as a cost-effective local communications system. Inspired by the methods of his rural Kentucky high-school chemistry teacher, an NSF-supported researcher has developed an artificial intelligence tutoring software that helps students confront complex science questions. 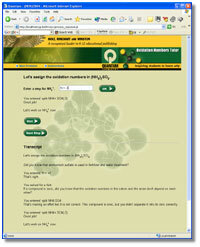 In 1998, chemist Benny Johnson founded Quantum Simulations, Inc. with high school mentor Dale Holder and colleague Rebecca Renshaw to create highly interactive tutoring software for the sciences. Many pre-existing tutoring programs store information in a database and do not allow for student input beyond multiple choice answers or simple responses. In contrast, the Quantum Tutors "converse" with students, said Johnson, "providing real-time feedback . . . Tutors respond to student questions, give hints, show correct next steps and even explain why a step is correct or incorrect using scientific principles." Students can enter any problem and related work, and the Quantum Tutoring Engines will understand and analyze all of the material. Any mistakes are confronted individually, and the student and the "tutor" provide information to each other throughout the learning exercise. "At each step of a solution, the computer is able to generate a set of questions that students can ask," said Sara Nerlove, a program manager in NSF's SBIR program. "This capability of Quantum Solutions' technology provides a degree of apprenticeship that goes beyond that available in a conventional tutor." 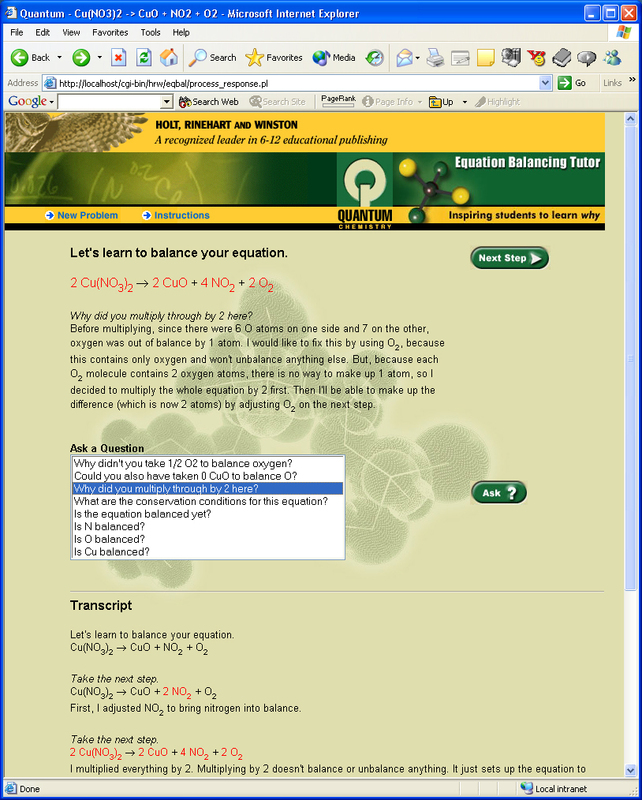 Quantum recently partnered with Holt, Rinehart and Winston (HRW) to include AI tutors as an Internet component in high school chemistry, physical science, and integrated science course materials, and middle school physical science materials. According to Renshaw, HRW is the first textbook publishing company to utilize AI technology for chemistry and physical science. 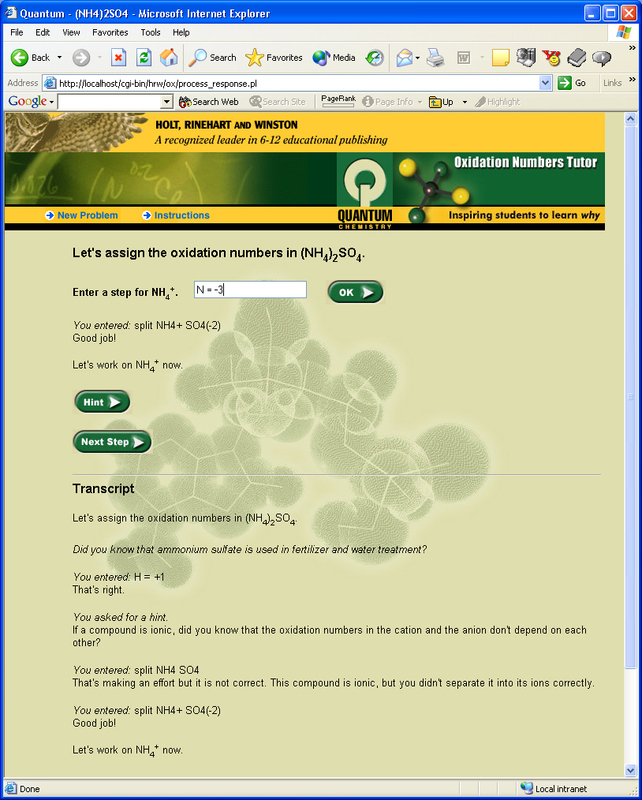 This screen capture demonstrates the HRW/Quantum product for Balancing Equations. 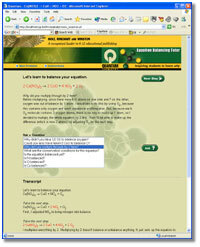 The product has an "Ask Questions" feature - a pull down menu that displays questions that change with each step the student takes. 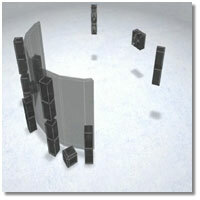 Photo Credit: Holt, Reinhart, and Winston/Quantum Simulations, Inc. This screen capture demonstrates a key software feature that allows students to enter their own work throughout the tutoring process. The Quantum Tutor interprets the individual work and guides the individual to a completed solution. A new laser technology may help research investigators by rapidly detecting and identifying trace amounts of gas and chemicals. Scientists funded by NSF spent more than a decade developing the portable sensing technology called cavity ring-down spectroscopy (CRDS), which is expected to reach the commercial market this year. CRDS is a promising technique to detect leaks from stored chemicals, contamination in ground water and vapor from concealed explosives or chemical warfare agents. Other potential uses include testing for impurities in the manufacture of electronic products and in diagnostic medical tests such as analyzing a patient's breath. The ability to monitor a network of sensors in real time via the Internet make it useful for monitoring environmental conditions at both large industrial plants and in neighborhoods. The miniature sensors use fiber optics, pulsed lasers and spectroscopy to identify a gas by measuring its absorption of light. Light is bounced back and forth between mirrors at each end of a cavity (the ringing process), and the decay rate of the light (ringing down) identifies the substance in the cavity.